"How about the Olympic Peninsula in Washington state?" I asked a globe-trotting friend. I was choosing a destination for a trip with my 30-year-old son. "If you get there, spit on it for me," she replied. lt turned out my friend's favorite neighbors had moved to the Olympic Peninsula to escape the heat and urban sprawl of their Southwestern city, and my friend was still mad about it. But since my research had already indicated that the O.P. might be perfect for an outdoorsy millennial and his foodie mom, her answer clinched the deal. During our five-day trip, we met many enthusiastic transplants — a waitress, a national park employee, the couple who ran our Airbnb — and all had come from afar to make the Northwestern corner of the Continental United States home. By the time we had circumnavigated the peninsula, we understood why. After meeting my son at SeaTac airport, we rented a car and took a ferry across Puget Sound, reaching our first stop, The Inn at Port Ludlow, in time for dinner. The coho salmon (caught that day 120 miles away in Neah Bay), a foraged mushroom and lobster dish, and a bottle of the local Gamay gave us our first glimmer of the area's bounty. In the morning, we took kayaks out on Ludlow Bay, gliding over gray-green water beneath tall pines, sneaking up on seals, otters and herons. 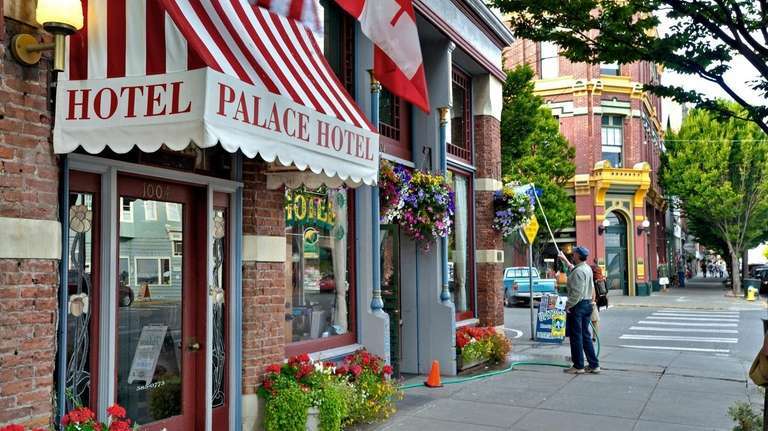 The charming village of Port Townsend was our next stop. We were staying at an Airbnb for the next few nights, so I gave in to the urge to shop at the alluring farm markets full of produce, cheese, flowers, honey and baked goods. At Finnriver Farm & Cidery, we were introduced to the bubbly joys of hard cider in a half-hour tasting of craft ciders like Fire Barrel and Lavender Black Currant. The orchards and meadows were full of children playing; people ate wood-fired pizzas with their cider in a lattice-roofed picnic area. We walked off the effects of lunch at the Dungeness Spit in nearby Sequim. This narrow strip of beach extends five miles out into the Strait of Juan de Fuca, the body of water that separates the United States from Canada. Victoria, British Columbia, is a popular day trip by ferry. At the end of the spit is a picturesque 1857 lighthouse where visitors can apply to stay as lighthouse keepers for a week. 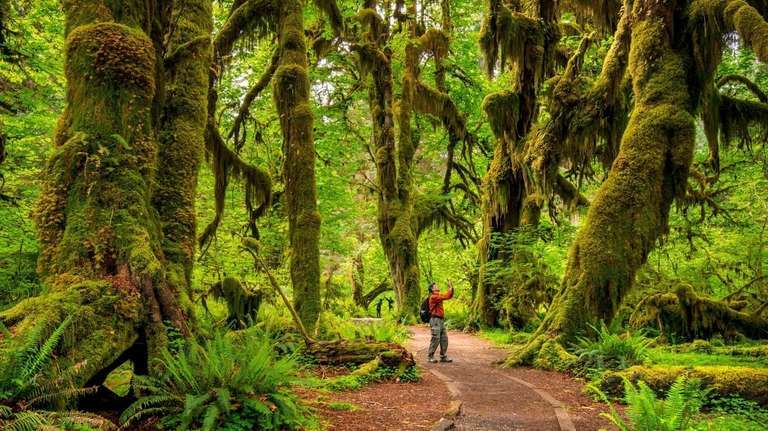 Encompassing nearly a million acres, the Olympic National Park encompasses three different ecosystems: snowcapped mountain peaks, old-growth forests and wilderness coastline. Port Angeles is the gateway to the mountains — and the home of my friend's ex-neighbors. Now that they were proud O.P. locals, they shared a few insider tips. At their urging, we left by 8 the next morning to begin the 17-mile drive up the Hurricane Ridge Visitor's Center. Since the most popular trail, Hurricane Hill, was closed for renovations, we chose a combination route — Cirque Rim to High Ridge to Sunrise Point. 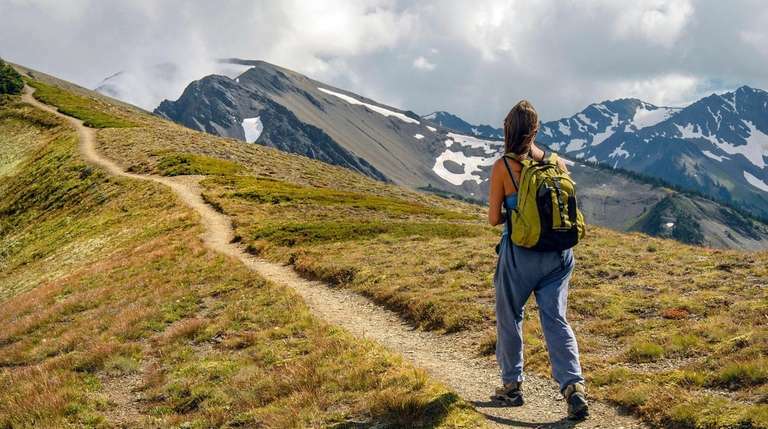 The one-hour hike led through stunning alpine vistas, with sightlines to Mount Olympus, the Cascades, the Pacific Ocean and Vancouver Island. When we came down into the parking lot, we realized how very lucky we were. By 10:30 a.m., a mob of visitors was heading for the trails en masse. Unbelievably, we'd had it to ourselves. That afternoon we rented bikes and rode the Olympic Discovery Trail, which runs across the whole peninsula. Our 12-mile slice took us through the woods and over the rushing Elwha River, restored to its original beauty and filled with wild salmon after a historic dam removal in 2011. We cycled out to the tip of Ediz Hook, where a paper mill gives a steampunk vibe, and along the waterfront to Port Angeles' downtown marina. There we locked the bikes and revived ourselves with steamed clams and local lagers overlooking the water. That night at a little restaurant called Bella Italia, we feasted on a rich, fragrant cioppino, a fish stew filled with local mussels, clams, scallops, halibut and Dungeness crab legs. It was served with a Sangiovese from Walla Walla. A very Washingtonian twist on Italian. The next morning found us on the road to Lake Crescent Lodge, so lovely we wished we had booked one of the simple cabins. 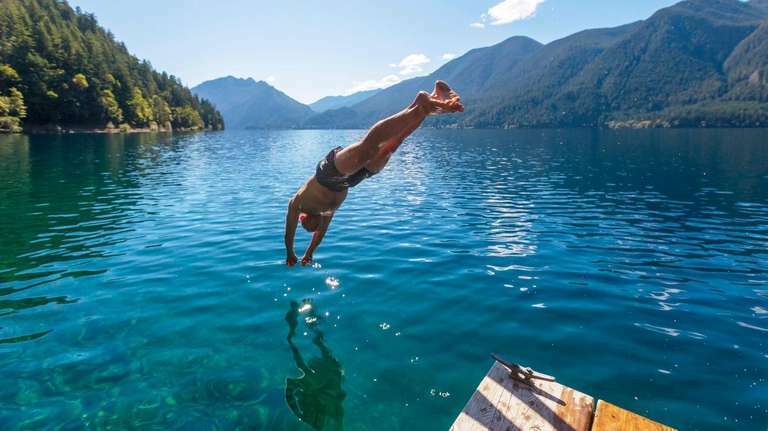 This brilliant blue lake, encircled by mountains, is clear to the bottom at 60 feet. My son could not resist a swim; I watched from an Adirondack chair. The hike to Marymere Falls gave us an appetite for eggs benedict with crab. Outside the town of Forks, now famous as the setting of the "Twilight" vampire books, we visited John's Beachcombing Museum. It is a crazy quilt of shelves, bins and walls covered with all the things retired plumber John Anderson, 61, has collected on the beach since 1976, including countless items from the 2011 tsunami: a whole shipment of Raggedy Ann dolls and hockey gloves, countless intact glass bottles and floats, a whale skull and a mammoth tooth. At the Hoh Rain Forest, we caught up with the crowds we'd avoided at Hurricane Ridge, so our hike through the verdant Hall of Mosses was less than leisurely. After warming up with clam chowder at Kalaloch Lodge, we spent the rest of the afternoon walking the Pacific beaches of the park. By now, the temperature had dropped into the 50s, and it was foggy and gray. Luckily, our room at the Ocean Crest Lodge had a fireplace, the hotel's spa had a hot tub and there was a cozy restaurant on-site. That night we left the balcony door open so we could hear the crashing waves. On our way back to Seattle, we drove up the beautiful Hood Canal to have lunch at the deservedly famous Hama Hama Oyster Saloon in Lilliwaup, a ramshackle shed with an outdoor counter serving picnic tables on a gravel beach. We ordered the raw oysters, the roasted oysters in chipotle and garlic, the oysters with pimento cheese and bacon, the fresh seafood cocktail and more local brews. We almost tried to order another round of everything — but as we said to ourselves many times during the trip, we would be back. Get a map booklet from Olympic Culinary Loop (olympicculinaryloop.com) — the most useful guide we had, not just for eating.